Updates to Barbara Overton's profile since your last visit are highlighted in yellow. My best memories are of working on The Jeffersonian and on the school plays. Barbara Overton Evans Newman has a birthday today. Barbara Overton Evans Newman has a birthday today. New comment added. 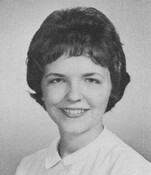 Barbara Overton Evans Newman changed her "Now" picture.